Lek Kiatsirikajorn has recently completed a project called ‘Lost in Paradise’. 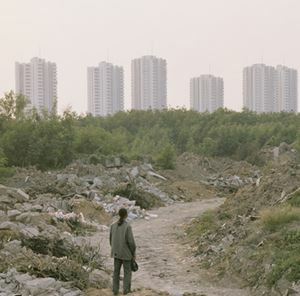 The project focuses on rural workers who have left their region of origin to work and live in Bangkok, existing in a no man’s land of peri-urban settlements where, paradoxically, nature is beginning to reassert its authority. Through these images Lek aims to present an allegory for modern Thailand: the country as a whole, like these workers, left its past of agriculture behind in search of a better life, but now finds itself trapped between this lost history and a better future which seems to remain just out of reach. Lek thinks of agriculture as the taproot of Thailand. Nearly half of the country’s population are farmers. Thai culture and traditions are directly related to it. In the 1980s, the Thai government at that time ambitiously wanted Thailand to become the fifth tiger of Asia. It means the fifth industrialised and developed country, in line with Hong Kong, Singapore, South Korea and Taiwan. The government passed laws and regulations that urged the international industrial investments in the country. Since then the numbers of agricultural workforce and agricultural resources have been decreased, and it has become one of the major problems Thailand is facing today. It has been about 3 decades since the ambition of the Thai government in the 1980s. Thailand still has not reached the goal of becoming the fifth tiger of Asia, not even close. Instead, its taproot has been rotted away by false policies. Only time can tell how long this big tree of Thailand will still be able to stand. Lek spent 3 years to complete this project, started from 2011 and finished in 2013. “ Lost in Paradise “ was produced with the support of the Quai Branly museum in Paris. Lek was one of the three photographers selected for the museum’s 2012 photography grant. 13 of the 22 images from the series have been included in the museum’s photography collection. Born in 1977, Lek Kiatsirikajorn studied painting at SilpakornUniversity in Bangkok before switching to photography, which interested him with its potential for outreach. He was promising young artist on the Thai scene in 2001 when he decided to move to England and study photography at The Arts Institute at Bournemouth. Lek has been working commercially, as well as working on his personal photography projects since he came back. He has also been exhibiting internationally. In 2013 alone, he exhibited in Bangkok, Shenzhen, St. Pertersburg and Paris.